Get The Results Your Company Deserves! Looking for the Best Website Company in Champaign IL or Urbana? -Combined 100+ years of internet experience under one roof! -One-Stop-Shopping-Webdesign309 can handle it all for your company. From websites to online marketing, custom videos to graphic design work. Your website reflects the image of your business. Since it can be the first representation of your company that customers see, choosing the right website design company is important. When starting web design project with us or while looking for a website company, Champaign IL business owners usually have a few questions about the process, development, and the results they should expect. Below are some helpful tips. How long will it take to build our site? This depends on how quickly our Project Managers get feedback from clients. Usually, the home page and interior page design phase takes two weeks. Next, it takes approximately four weeks for our developers to build your site. After that, we just need to add photos, content, etc. and then we can launch. Our typical project takes around 10 weeks. How will my new website look on phones? 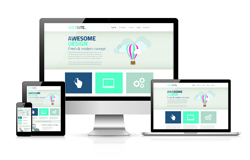 All websites we design are mobile responsive. Most people use their phones to find what they need, so we will make sure your site looks just as good on a phone as it does on a desktop! Will my website show up on page #1 of Google? To get your website on page #1 of Google, you need content centered around the keywords you want to rank for. Because of this we have professional content writers on staff that do everything possible to obtain page #1 results. There is no guarantee that your site will land on page #1 of Google without additional online marketing, however many of our clients obtain high rank without spending additional funds. We do offer Search Engine Optimization (SEO) packages and SEM (search engine marketing) that drive traffic to your business online. 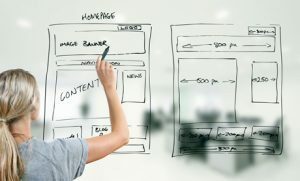 Why do you design the home page before beginning development? All of our websites are custom built around our clients’ needs. This is why we get the designs approved first so we don’t waste precious time writing code to only start from scratch later. This is also the first page people see and it needs to be perfect! What if I don’t have photos/content for my site? Sometimes, especially if a company is new, people do not have time to write content for their site or photos to use. If you are missing either photos or content, just let us know. We can provide a photographer or use stock photos and write content for you. This also ensures your content will be optimized for SEO! We have built over 1, 100 websites in only 5 years! Our firm specializes in getting the job done right and on time, which is why we are the trusted website company for Champaign IL. We offer web design and marketing services throughout Illinois, including Peoria IL, LaSalle/Peru IL, Decatur IL, Galesburg IL, Schaumburg IL, Chicago IL, Monmouth IL, Canton IL, Lincoln IL, Springfield IL, Normal IL, Naperville IL and the Quad Cities: Moline IL, Rock Island IL, Davenport IA and Bettendorf IA. We also offer these same services throughout the country, and have designed websites for clients in New York NY, Tampa FL, Key West FL, Clearwater FL, St. Petersburg FL, Jasper IN, Indianapolis IN and more.